1. Contest is open to all individuals age 16 years or older who are students, teachers, faculty members or business professionals. 2. A participant can be named as an individual a maximum of once. Individual participants are eligible to be recognized more than once. 4. Any nonconforming entries will be disqualified. Altered, defaced, mutilated, illegible, or incomplete video presentations are not eligible and will result in disqualification of entry. 5. Entries that contain any content that is pornographic in nature, lewd, or sexually explicit will be disqualified. After each entry is screened for compliance with the entry requirements, it will be judged by an independent panel of judges selected by PresentationTube. 6. The judges' decisions are final and binding. 7. 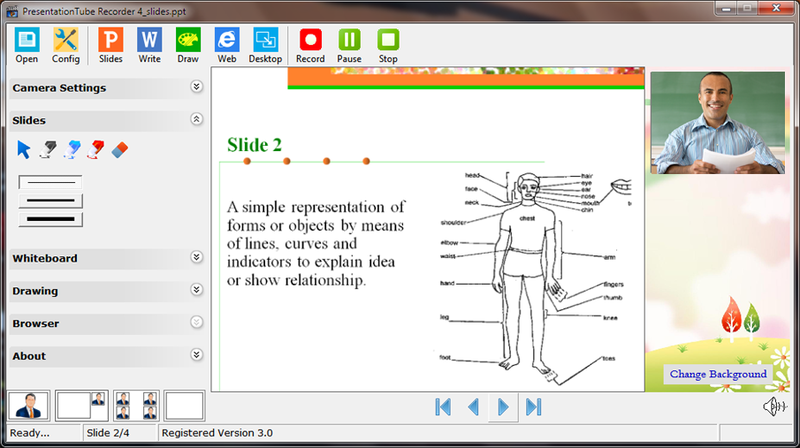 The video presentation should integrate a variety of presentation aids and synchronizes presenter's audio and video, PowerPoint slides, whiteboard, and drawing board. 9. First slide should contain information on: title of the topic, and author details (name, school, university, country, etc.). 10. Add the statement "This presentation does not include plagiarized material" on the last slide. 11. The video length should be from 10-15 minutes, with no more than 20 slides. After uploading your video presentation, send a message with the subject "Win" and your video presentation link to support@presentationtube.com.